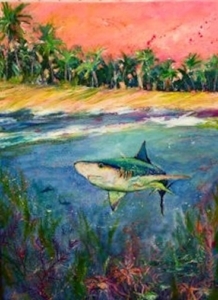 One of the paintings from my Florida Floats My Boat series is this one, depicting a shark swimming in the waters off the shoreline of a beach covered by coconut palm trees. Sharks are a common occurrence in Southwest Florida, although attacks are virtually unheard of (just 8 documented cases since 1882). Still, there have been a couple of famous sharks to appear in our waters. 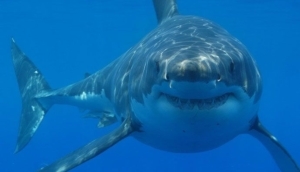 Great white sharks don’t like the tepid waters of the Gulf of Mexico. Not normally, anyway. But a couple of years ago, a Great White by the name of Katherine was spotted in the waters off Southwest Florida. 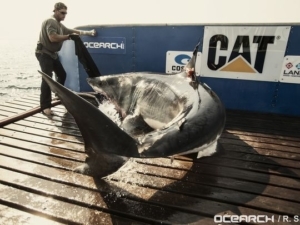 She was tagged off Cape Cod in 2013, so scientists can track where she is. And yes, she swam all the way down the Atlantic, through the Keys and into the Gulf of Mexico in 2014. She was swimming off Jupiter and the Treasure Coast earlier this year, but is now heading back north, somewhere off the coast of North Carolina. Another famous denizen of the deep here in Southwest Florida is a hammerhead named Old Hitler. His favorite spot is the pass in Boca Grande, but he’s been spotted off Tampa as well as in the waters near Naples. In fact, Old Hitler was highlighted on the Discovery Channel’s Shark Week back in 2014. Some think he’s more legend than fact. If he’s real, he’d be 70 years old now and more than 25 feet long! In fact a writer in Naples calls him the Loch Ness Monster of Southwest Florida. Yuk Yuk. Love ‘em or hate ‘em, sharks live in our waters just like they live pretty much everywhere else. 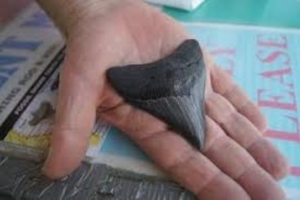 They’ve been around forever, and along with shells, hunting for shark teeth is a popular activity by folks who come to Sanibel and Fort Myers Beach. There’s no denying their popularity, as evidenced by the fact that they’re one of sixteen images that Bealls opted to include on my Leoma Lovegrove line of products. I hope you like this guy as much as I do. Originals and prints from Florida Floats My Boat and my other series are on sale at Lovegrove Gallery & Gardens. Drop by. We’d love to entertain you. Or give us a call. The number is 239-938-5655.